The storm had dumped more than 20 inches of rain in parts of central South Carolina since Friday. South Carolina auto dealers and BMW AG are digging out and adjusting after more than 2 feet of rain have fallen over the last three days in some parts of the state, leading to catastrophic flooding. BMW’s U.S. plant in Spartanburg, S.C., reported that flooding in Columbia, S.C. -- where the Congaree River rose 10 feet in 12 hours according to reports -- has delayed rail transfer of finished vehicles to the Port of Charleston. Seventy percent of the plant’s vehicles are exported. “BMW will work closely with state authorities to assess alternative options, including movement by truck to the Port of Charleston,” BMW spokeswoman Sky Foster said in a statement. Daimler Vans Manufacturing, which produces the Mercedes-Benz Sprinter van in Ladson, S.C., near Charleston, was shut down on Monday. The plant itself was not impacted by flood waters, but it was not running because of widespread road and school closures. It was too early today to assess the damage to the state’s new-vehicle dealerships in areas hard-hit by the floods. Many stores were not answering their phones today and there was no answer at the South Carolina Automobile Dealers Association office in Columbia. The storm had dumped more than 20 inches of rain in parts of central South Carolina since Friday, the National Weather Service said. The state climatologist forecast another 2 to 6 inches through Monday as the rain began to slacken. South Carolina Gov. Nikki Haley said parts of the state were hit with rainfall that would be expected to occur once in 1,000 years. Spartanburg Chrysler-Jeep-Dodge was hit especially hard by the historic flooding. General Manager Darrin Shelton said the dealership will have to total about 105 vehicles after water swept them away during a Thursday morning flood. Shelton said he has two other stores within 70 miles of the dealership and will replenish its inventory by moving vehicles over from there after the totaled vehicles are removed. In the meantime, he said the dealership has had “normal” selling days. The dealership typically sells between eight and 15 vehicles a day, and Shelton said the dealership has kept up that pace since Friday. “It’s been a very smooth transition,” Shelton said. Business has also kept up at McDaniels Audi in Charleston, S.C., General Manager Scott Firth said. Despite the torrential rain and widespread flooding, business in recent days has been “actually good,” he said, as customers have come in to get repairs done before leaving town. The dealership has even sold some vehicles in the midst of the rain. “People are buying regardless of the weather, I guess,” Firth said. They’re also buying at Fred Anderson Toyota of Charleston, though at a slower clip than normal. General Manager Steven Rhoads said the dealership, which is in “good shape,” sold 10 new and used vehicles on Friday and nine on Saturday, below the 15-18 he said they sell on a typical Friday and the 20 or so on a regular Saturday. Rhoads expects sales to pick up significantly as flood waters recede and clean-up begins. “There are a lot of flooded cars around here,” Rhoads said, pointing to nearby apartment buildings that had cars in their lots nearly totally submerged. Six weather-related deaths were reported in South Carolina, four of them from traffic accidents. Officials reported another two deaths in North Carolina. 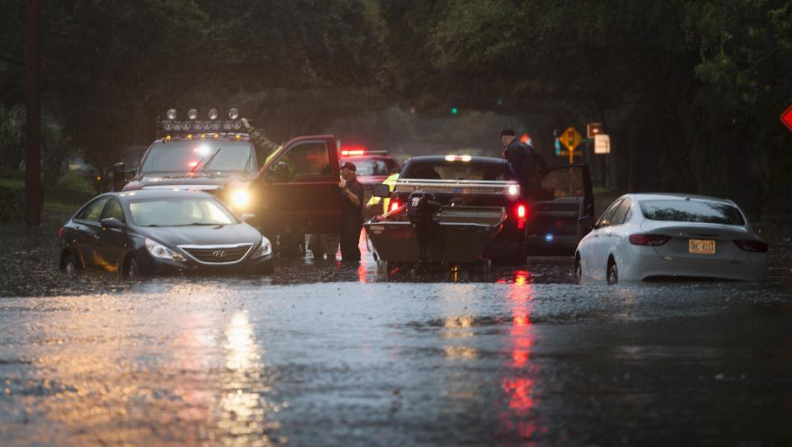 Rains flooded highways along the South Carolina coast between Charleston and Georgetown, the weather service said. Georgetown, a city of 9,000 people, was mostly under water, and the four major highways leading into it were closed. "We have every ambulance in the county out responding to calls. People are being moved from their homes in boats," Georgetown County spokeswoman Jackie Broach said. A 70-mile stretch of Interstate 95, a major East Coast highway, was closed because of high water. The state Highway Patrol reported 315 collisions and 318 cases of roadway flooding. Hundreds of flood rescues were carried out, and eight water rescue teams were operating, with more coming from other states, South Carolina's emergency management office said. State emergency officials urged residents not to travel due to unsafe roads, and curfews were imposed in eight cities or counties, including Columbia. Schools and universities canceled Monday classes.